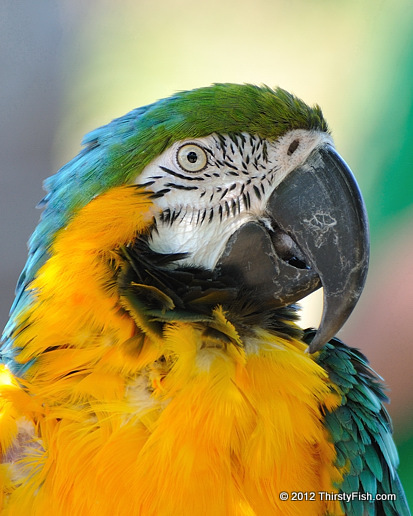 Macaws are generally colorful neotropical parrots native to Mexico, Central and South America, and the Caribbean. They are mostly associated with rainforests. The Blue and Gold Macaw is a large (30 to 34 in) bird, popular as a pet because of its vivid appearance and ability to mimic human speech. Due to its size and loud vocalizations, it is a hard-to-care-for pet. Zero is a surprisingly difficult concept to comprehend. Ancient Greeks were uncertain about "how nothing could be something". While the Mayan numbering system included zero 2000 years ago, the Western world did not have a systematized concept of zero until the introduction of Hindu-Arabic numerals to Europe in the 12th Century. In fact, since the Gregorian Calendar begins in the year 1 A.D., many people do not comprehend why the third millennium actually began in the year 2001, and not the year 2000. What does the "concept of zero" have to do with parrots? A study suggested that an African gray parrot named Alex, may be able to comprehend the mathematical concept of zero; something an average three-year-old child can not grasp. This photo was taken at the John Heinz National Wildlife Refuge during the 2010 Annual Cradle of Birding Festival.